It's about time Judge's told it like it really is, and held parents to account. If only more Judges would let it be known that they ae looking for the mature parent...Great story here...we need to see more Judges do things like this that instruct parents that their lawyers encouraging them to fight is not the way to go. It's about time Judge's told it like it really is, and held parents to account. If only more Judges would let it be known that they ae looking for the mature parent...Great story here...we need to see more Judges do things like this that instruct parents that their lawyers encouraging them to fight is not the way to go. Waging War Over Kids in Family Court is child abuse of the highest order. Call it a cautionary tale, made for TV. A Hamilton Superior Court justice issued a creatively construed warning to divorcing couples in a custody battle decision, drawing inspiration from a hugely popular HBO series. "Breaking Bad, meet Breaking Bad Parents," wrote Justice Alex Pazaratz, imagining a "sad reality show" that riffs off the name of the program about a cancer-stricken man's metamorphosis from meek high school teacher to death-dealing drug lord. "SPOILER ALERT," the justice wrote. "The main characters in both of these tragedies end up pretty much the same: Miserable. Financially ruined. And worst of all, hurting the children they claimed they were protecting." The unconventional TV show analogy is meant to serve as a "sobering warning," Pazaratz says in his decision. "Will these parents sign up for the permanent cast of Breaking Bad Parents? Will they become regulars in our family court building, recognizable by face and disposition? Or will they come to their senses; salvage their lives, dignity (and finances); and give their children the truly priceless gifts of maturity and permission to love?" The case that prompted Pazaratz's extended metaphor involved separated parents from a Hamilton suburb, arguing over how to share custody of their two sons, who are under five. The mother, Candace Coe, had brought forward a motion to get temporary sole custody of the kids, accusing their father, Derek Tope, of being prone to anger, aggressive and "abusive." Noting both parents "sound like pretty decent people," Pazaratz rejected Coe's claims and ruled that she and Tope split custody of their children 50-50 for the time being. He concluded his ruling by returning to the Breaking Bad parallel. "I hope I didn't offend the parties," Pazaratz wrote. "They're not bad parents. Yet." The justice went on to implore Coe and Tope to stop being "nasty," try harder to resolve their disagreements without going to court, and work together to find the best possible postmarriage arrangements for their kids. Michael Clarke, Tope's lawyer on the case, said his client received the message loud and clear, and is happy with Pazaratz's judgment. "The sentiment is a good one," said Clarke. "We want to try to reduce conflict in family law cases and (Pazaratz is) worried these people are headed down a destructive path and they need to be careful." Coe's lawyer declined to comment on the ruling. Pazaratz isn't the only judge to spice up his legal jargon with a compelling metaphor or literary spin. 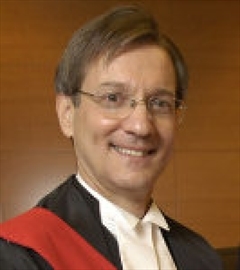 Toronto Justice Fergus O'Connell, for instance, once employed Shakespeare and Lewis Carroll references in a Highway Traffic Act case. Niagara region judge Joseph Quinn is also known to have penned some colourful quips in his family law decisions, including: "Paging Dr. Freud. Paging Dr. Freud." When it comes to Pazaratz's ruling, Anne Freed, a family lawyer and divorce mediator in Toronto, applauded what she saw as the justice's use of creative flourish to hammer home a serious point: for the sake of their children, parents should only fight it out in court as an absolute last resort. Out-of-court meetings, visits to divorce counsellors and the use of mediators are smoother methods to resolve disputes, Freed argued. The "adversarial" family court system, which relies on lawyer's arguing about untested claims in affidavits before a judge, can unnecessarily prolong cases and make arguments nastier than they need to be, said Freed. "It gets to be very polarized, this kind of court fight. And horrible. People say horrible things about each other," she said. "It's an example of how things can climb to a fever pitch. And really — was it necessary? That's what this judge is saying." Near the end of his decision, Pazaratz sums up the message of his Breaking Bad-themed treatise, strongly advising the former partners to rise above their animosity for each other and solve their differences out of court. "Stop acting like you hate your ex more than you love your children," he wrote.